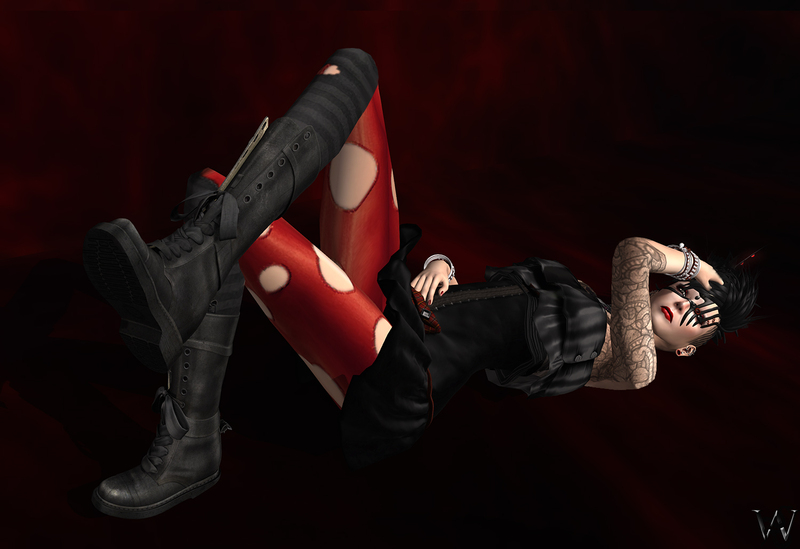 Wicca’s Wardrobe: LOTD 08/31/2013 – Glamour Punk? Today again it was one on of the days where I did not plan to style something special… it just had happened during I sorted my ineventory ;). “Face Armor” mask, that she put in the Gacha Fair and I was lucky to pull the rare one while I was gambling at those gatchas. I had no special idea for that mask in that moment and sometimes things even get better when they lay around for a while, just like cheese or a good red wine 😉 . Usually I do not sort those “I do not know yet” items in my inventory right away, I just leave them be where they are so every time when I open my inventory, I stumble over them and so, I keep them in mind better, than when I sort them in where they belong to. I put on that mask and while was wearing it, I kept sorting all the amazing stuffs I got and those I already blogged and was too lazy to sort in yet. That brought me to the amazing, sweet “Kitty Skirt” as well from Yasum. This short dress really is a cute base for a smart styling. I chose the black version with the light red accents and the red tartan pocket in the front. The “Kitty Skirt” is top less so it starts right under the chest, so I had to find a top for it. I was trying different kinds and in the end my decision fell on the “Lourdes” top from LeeZu. It is not a very new item of LeeZu but one that I really like and already was wearing a few times in all of its colors. The “Lourdes” top was perfect with the huge ruffles over the chest and the one line that leads up to a beautiful neck collar wich is ornaments with little flowers. The short dress and the ruffled top reminded me on my youth and the punky styles I loved so much, so decided to go towards that direction. With some Vivienne Westwood in my mind because of the tartan pattern I wanted to add some leggings since she is really well known for all her socks and leggings stuff and that she combines different fabrics that do not get together on the first view. First I tried some socks and ripped stockings but that became way to trashy for that what I wanted to go for. I tried more the cute side of tights and socks but that as well was not that what I was looking for. Again the choice fell on one of my long time favourites from LeeZu, the “Cat Tights”. To add a bit more I put the “Knee socks” with the little holes over the tights. To not go towards the cute look too much I added the “Triumph” boots made by [GOS]. The heavy boots gave a good contra to the sweet ruffles of the “Lourdes” top. The amazing tattoo comes from White Widow. The “Mission” tattoo has 2 options one low and one normal. I decided to go with the normal one as I remembered some cool bangles from Xplosion I got long ago. The red leather together with the silver metals and that 80s look of them, just perfect matched the look. The huge tunnels and the piercings for the ears, are part of the mesh ears from Mandala. With the HUD that comes with them yo can recolor the tubes, metals and gems to match your outfit.